The fireplace is an important focal point of a room. Decorating it can enhance the atmosphere elegance of the environment . At Decorative Architectural Shapes we specialize in fabricating many foam products including fireplace surroundings. Made only from the highest quality polyurethane, we guarantee you will find a profile that meets your projects requirements. Decorative Architectural Shapes can create any custom fireplace surroundings. 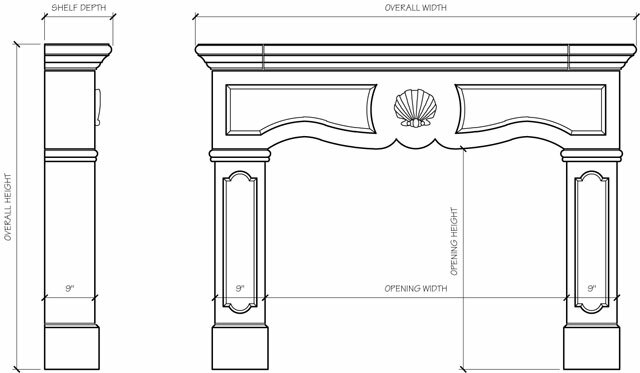 Create the design of your fireplace surrounding from start to finish. Choose from any custom architectural design, texture or color that you can think of for your project. We can even fabricate additional body tops and side wings to fully cultivate the atmosphere of the design. We guide our customers through every detail, from the trim to the mantle, to best accommodate creative intent. No job is to large or too small. You can customize even the smallest portions of your fireplace, or even add body tops and top stacks to accentuate your fireplace. Decorative Architectural Shapes fabrications are ideal for minor repairs and even complete restorations. Replace commonly damaged areas such as mantles, hearths and wings to make them look brand new. Because Decorative Architectural Shapes fabrications are so affordable and simple to install, creating the fireplace you thought you could never have a possibility. Do not hesitate to inquire about certain specifications. We assure you we can meet the requirements of any job. In an endeavor to ensure your satisfaction, we will see to it that every detail has been accounted for.